2-Eleanor Walker was born on 2 Aug 1846 in Annandale, Perth, Tasmania, died on 6 Nov 1907 in Ulverstone, Tasmania at age 61, and was buried in Nov 1907 in Ulverstone, Tasmania. Eleanor married William Henry Appleby, son of William Walton Appleby and Mary Sweet, on 1 Nov 1867 in The Appleby Home, Deloraine. William was born on 20 Apr 1847 in Exton, Tasmania, died on 20 Apr 1917 in Exton, Tasmania at age 70, and was buried in Apr 1917 in Ulverstone, Tasmania. Eleanor walker was the sixth child of Michael and Sarah Walker and was born on the 2nd August, 1846, while the family were living at "Annandale" near Perth. Sarah would have been delighted to cradle her little daughter in her arms and dream a little of pretty dresses and help in the home as Ellen grew older. The family moved to "Greenhills", Hagley when Ellen was scarcely two years old and then to Marsh Paddock, Exton in 1856 when Ellen was 10 years old. Ellen would have attended school at Glenore.The years came and went, the family working hard during the week and on Sundays, attending church and Sunday school, enjoying the fellowship of friends and neighbours. It was on such occasions that Ellen became interested in and later married William Appleby. William Henry Appleby was the first son and third child of William Walton Appleby and Mary (nee Sweet) born at Exton in 1847. 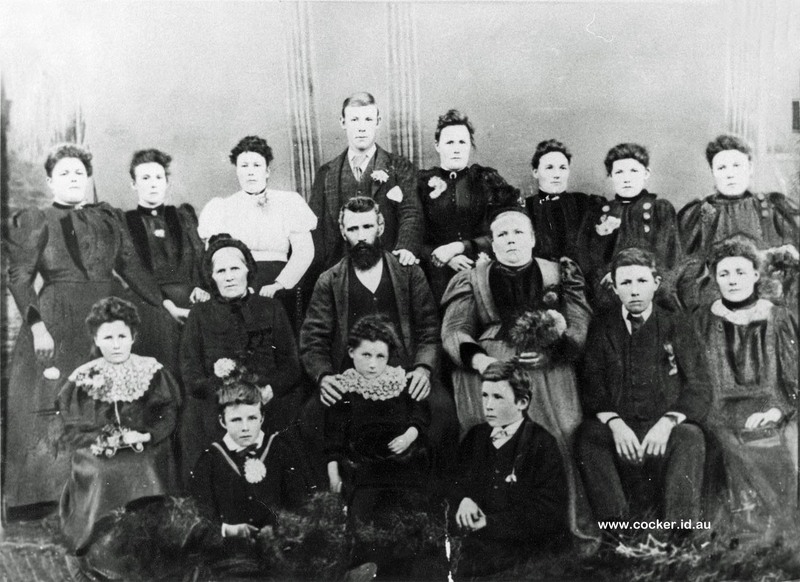 The family moved to Longford in early 1850's and were farming a property nearby. The Appleby family tree has its origins in rural Somerset, England. Emanuel Appleby (1760-1797), lived in the small village of Kingsdon, boasting a few hundred inhabitants approximately 15 km. south of Glastonbury. Emanuel and Love nee Ludwell are known to have had two sons, William (1786) and John (1796). William became a baker for many years and later a coal hauler, moving to nearby Long Sutton after marrying Elizabeth Walton. 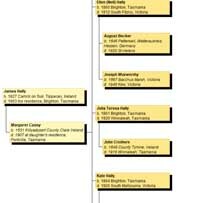 The oldest of their seven children, William Walton (1814-1884), was the first to emigrate to Tasmania. Receiving assisted passage, he embarked on the Corsair and after several months at sea arrived at Launceston on 8 May 1842. Within a year or so of his arrival, William met Mary Sweet (1819-1908). Mary was also an assisted immigrant, arriving in Launceston on the Arab from London on 31 March 1842. They married on 13 September 1843, at the Church of England, Longford, and their first child Elizabeth was born 9 months later. The family settled in the Westbury area, and by the 1850's they were living at "Marsh Paddock", a marshy area just east of Exton on the Westbury road. Another 4 brothers and sisters joined Elizabeth up to 1851, but in Spring 1853 an outbreak of scarlet fever carried off Elizabeth and siblings Sarah, Mary and Thomas. Family tradition records that on 26 Sept 1853, William attended the funeral of his son Thomas at Deloraine, and returned home to discover that his daughter Elizabeth had died while he was away. Because of the seriousness of the epidemic, the doctor found it necessary to leave medicines on the gate posts, rather than come into contact with the patients. It is hard to imagine William and Mary’s feelings as one child after another died until only William Junior was left, but they did have further children. In later years William suffered badly from arthritis and was confined to his home and for this reason Ellen and William were married in the Appleby home in 1867 and not at the home of Michael and Sarah as their other children were. After their marriage, Ellen and William leased a property of 140 acres from William Field of Westbury, where they lived from 1867 to 1882. They moved to Chudleigh for a short time then onto a property of 84 acres known as the "Little Den" and owned at that time by Sydney Higgs. During his stay there William built a two storeyed house for Henry Dobson of Exton (his brother-in-law) on an adjoining property, thought to be in payment for the lease of the land. During 1887 they returned to Exton and leased a farm of 700 acres belonging to James Garrett. In 1891 they moved to West Gawler on the north-west coast and then to Abbotsham. Ellen was a very large lady weighing some 22 stone. Once when in a hurry she tripped on the mat in front of the open fire and the unfortunate cat was not able to survive the encounter and Ellen was bruised and badly shaken. One lady told how she used to walk to the gate each Sunday to watch the Appleby girls when dressed for church as they were always so beautifully dressed. Ellen taught her children all the arts of homemaking, and loyalty to family and friends. She was a very hospitable person and was said to have a heart of gold and patience without end. Should Ellen have lived to see her daughters mature she would have been well rewarded for her efforts. Ellen died at the age of 61 years and was buried at Ulverstone.